Time for a new purse! Well, when isn’t it time for a new purse?! 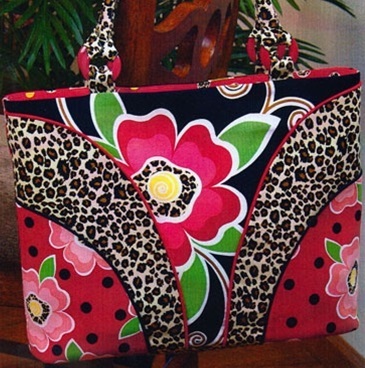 I spent some time choosing patterns and then fabrics that I thought would work well with the patterns. 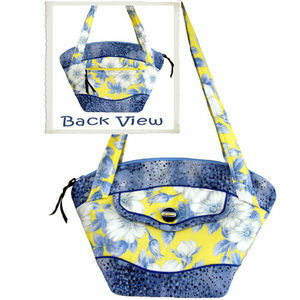 Purse-O-Nally Yours bag and Wander Blossoms fabric: the flowers for the body of the bag, plaid for the top and bottom borders and for the handles, and the blue polka dot fabric for the trim on the flap pocket. Or would you use the stripes in place of the plaid? 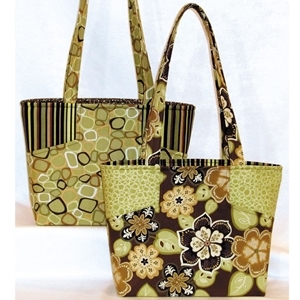 Twin Pocket Tango bag and Zest fabric: the gray flower circles for the bottom corners with yellow piping, the flowers for the two curved pieces with grey piping, and the yellow flower circles for the center of the bag. 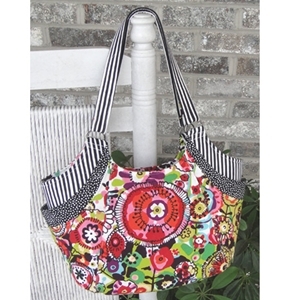 Margo Handbag by Lazy Girl Designs and Petite Odile fabric: Red for the main body of the bag and for the handles. The darker fabric for the pocket background. Quattro Purse and Flying Colors II fabric: the colorful butterflies on the black background for the main body of the purse, the light background with the hummingbirds for the first pocket, and the stripes for the last pocket and for the handle. Now it’s time to pick a favorite. That might be a little harder! Debbie Mumm did it again! She created another colorful, fun collection – this one is all about Santa. 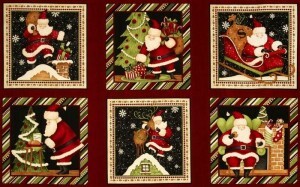 Santa is doing lots of Christmas chores in the panel fabric. Each image has its own border - either a diagonal stripe or holly leaves with red dots - making it easy to create projects quickly. You will need to do less piecing and yet will still achieve an interesting look. Other fabrics in the collection include tone on tone mini dots in red and in green . . . .
. . . . more tone on tone fabrics, this time in black and a lighter green with festive scrolls . . . .
. . . an Ivory background with snowflakes of different sizes . . . . a diagonal stripe in red, green, black, white and ivory . .
. . . . and “Tossed Santas” – he and reindeer and presents are scattered across a scrolly Ivory background. 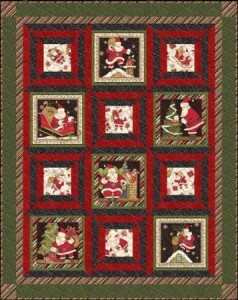 Now, this fabric is so fun and cheery that you are sure to have something in mind for it, but if you are drawing a blank, or just can’t decide how to use it, there’s a kit available: the Rooftop Santa Quilt Kit. Using the panel fabric, some green, some red, plus the striped fabric, this lap quilt finishes at 51″ x 64″ and it’s sure to quickly become a family favorite. 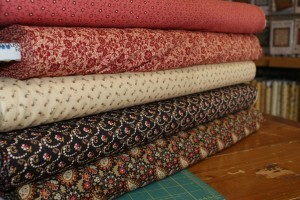 There are so many new fabrics in the shop! It’s hard to choose what to try first! Do you know a horse lover? Hmm, that probably encompasses 50% of the teenage girl population. Mustang Meadows Packed Horses Brown is one of the fabrics in the Mustang Meadows collection. There is a panel that includes three different scenes, a repeating stripe that also includes three different scenes, two more horse filled scenes, two meadow landscape fabrics, and a sky scene with deep blues and fluffy white clouds. 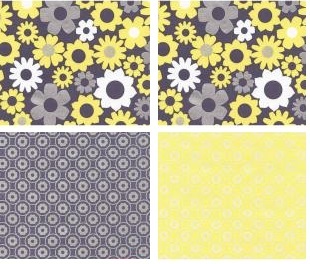 These would make a great quilt for Christmas gift giving. With the beautiful horsey scenes, large blocks and/or wide borders might be best, so a quick finish would be assured. If you like soft blues with just a hint of green the Galeria fabric collection will delight you. 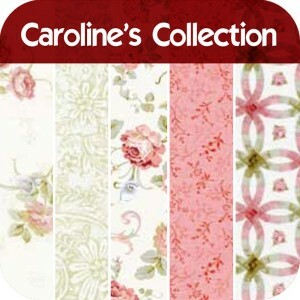 The fabrics include four watercolor type prints and two soft linen looks. Shown here is the Galeria Encantada Border Stripe. Earthy brown, night sky blue, and cream are the colors of the Shaded Oaks fabric collection by Holly Taylor for Moda. Simple drawings of trees and branches accent some of the fabrics, and two of the fabrics have a marbled look to them – one in blue and one in brown. Make comfy winter quilts from this soft flannel collection. 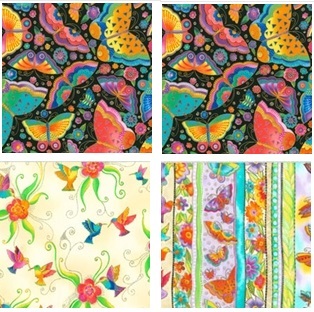 You might want to browse all the quilt fabric collections to see other new items or old favorites. Six Halves Books And Fabric Bundles – A Great Match! 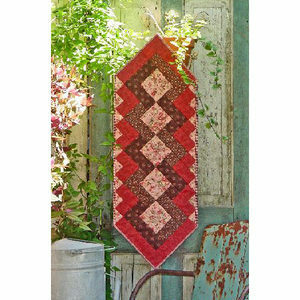 Susan Knapp and Mary Jane Mattingly of The Quilt Branch have written a series of books titled “Six Halves Make A Whole”. 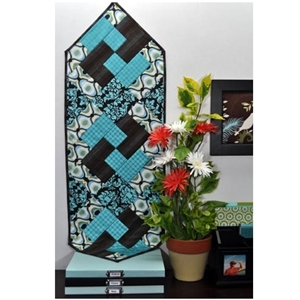 Each book has several projects each of which can be made with six half yard cuts of fabric. Fabric Bundles are bundles of fabric from a fabric collection - you can choose 1/4 yard cuts, whole yard cuts, or half yard cuts – perfect for pairing with “Six Halves” books! 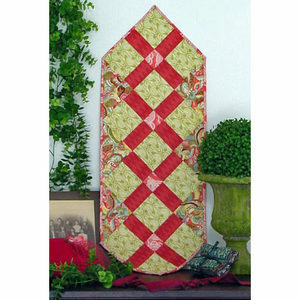 Six Halves Make A Whole Christmas has patterns for Christmas Stockings, a tree skirt, pillow shams, and lap quilts. The Holiday Medley fabric bundle would pair with this book nicely. The first book, simply Six Halves Make A Whole. 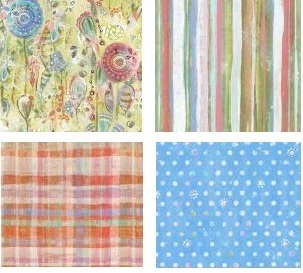 Try the Farmland fabric bundle with this book. 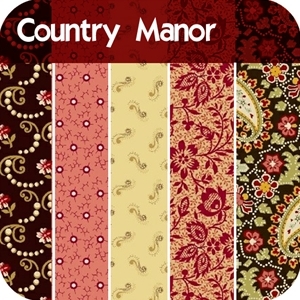 The Farmland Bundle has 7 fabrics. Make your quilt with 6 of them and use the 7th for the binding. Or, for your resident sports fan, use the Sports Xtreme Patch fabric bundle. 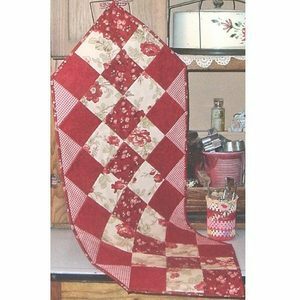 Six Halves Make A Whole Lot More has patterns for five quilts and a set of placemats. Pair this book with the Petite Odile fabric bundle. 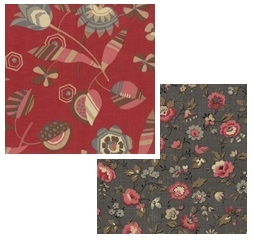 The 7 fabrics of Petite Odile feature greys and muted reds reminiscient of 19th century France. Enough fabric for your quilt and for your binding. Or use that extra piece as part of your backing. and Six Halves Make A Whole Starburst. What fabric bundle would you use for these two books?